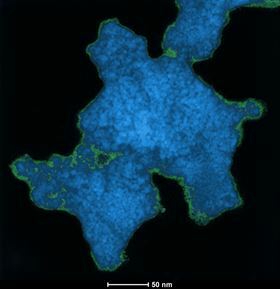 An electron microscope image of a network comprising cross-linked titania nanoparticles with boron-based clusters. Image: UCLA/Alexander Spokoyny. A team of scientists from across the US has found a way to create molecular interconnections that can provide a certain class of materials with exciting new properties, including improving their ability to catalyze chemical reactions or harvest energy from light. In a new study, researchers at the US Department of Energy (DOE)'s Argonne National Laboratory, the University of California, Los Angeles (UCLA), the University of California, Santa Barbara, Purdue University and the University of Oregon have developed a method for creating linked networks of metal oxides that can possess interesting catalytic or electronic properties. The study is described in a paper in Nature Materials. Metal oxides are of interest to scientists because of their unique electronic and chemical properties. Some, like titanium dioxide, are commonly used in photovoltaic and photocatalytic applications because of their ability to absorb light. The key to forming these metal oxide networks is boron. When annealed with metal oxides, boron leads to the formation of thermally robust and stable interconnected clusters that act as strands of glue to connect a metal oxide web. "This glue has the ability to be a key component of the entire reactive system, changing the properties that the metal oxides had on their own," said Alexander Spokoyny, a chemist at UCLA. The formation of the boron-metal oxide network provides a launching point for future studies of different materials that could combine their own natural properties with the added advantage of a similar ‘cross-linked’ structure. "We want to know, for instance, if we can transfer our knowledge of this mesh to a material like silicon dioxide. The photocatalytic properties of these materials are extraordinary compared to titanium dioxide," said Argonne chemist Max Delferro. In the future, the researchers will seek to develop a way to create precisely tailored materials by perfecting how the interconnecting clusters of boron ‘glue’ are interspersed within the metal oxide. "If we can stitch in these molecules exactly where we want them to be, it will give us a powerful ability to make and understand hybrid materials with a wide range of uses," Spokoyny said. Because these materials are so new, the researchers believe they have a great deal of untapped potential. "We're not claiming mission fully accomplished by any means; there are still parts of the chemistry that we don't fully understand and appreciate," Delferro said. The research team included Argonne chemist Karena Chapman, who works at the laboratory's Advanced Photon Source (APS), a DOE Office of Science User Facility. Chapman and Spokoyny met when they were both named on Chemical and Engineering News' ‘Talented Twelve’ list in 2016, and then established the collaboration that led to this research. According to Chapman, a member of the Structural Sciences Group in the APS X-ray Science division, the structural characterization of the material involved conducting X-ray pair distribution function analysis at the APS. This technique provides local structural information about the relative atom positions. Chapman, Delferro and Spokoyny noted that the efforts of the research team to produce and analyze this new material were just as interconnected as the discovered hybrid material itself. "There are cross-linkages at both the molecular and the human level," Delferro said. "This work proves that we work better and are stronger when we're connected." Scientists have created a light foam from two-dimensional sheets of hexagonal-boron nitride that absorbs carbon dioxide.